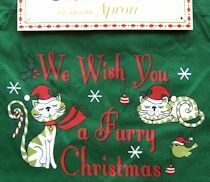 Two cats on this Christmas cat apron are wishing you a "Furry Christmas". The butcher-style apron is 33" long x 26" wide not including the ties. The apron is 100% cotton; the ties are 100% polyester. Purrfect for holiday entertaining.